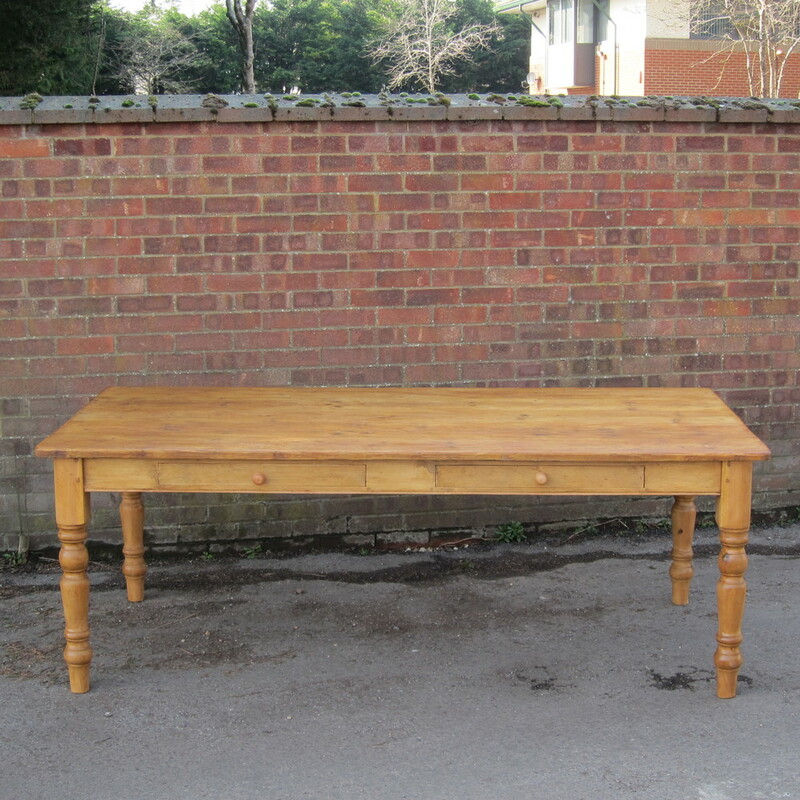 We can make pine tables to any size from old pine floorboards or cleaner old pine roofing timbers or scaffold boards. 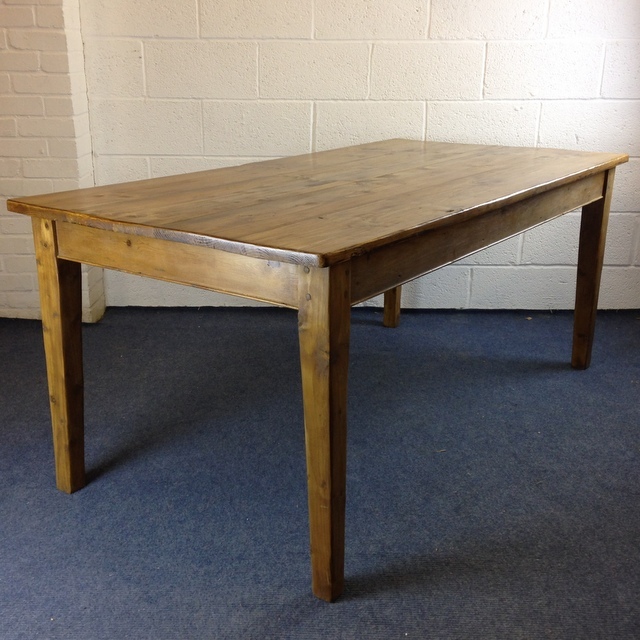 Our handmade bespoke pine tables can be made to any size, height, and with any amount of leg room. They can be waxed, painted, or maybe you'd prefer a waxed top with a painted base. Drawers can be made, and are £50 each and can be fitted to the sides or the ends. We can also make push - pull drawers... which is a drawer made the full width of the table. They can be opened from both sides of the table (please ask for more details). Tables can be made with turned, tapered of straight legs. 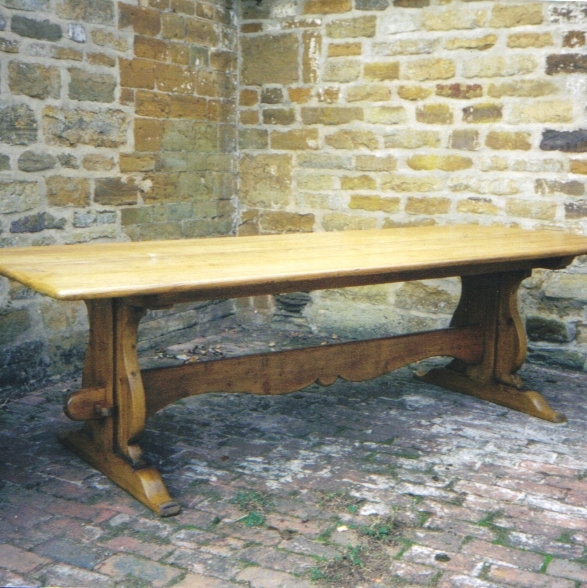 Refectory and Trestle tables and coffee tables can also be made to any size. You can see example of many styles of tables we have made in the past below. 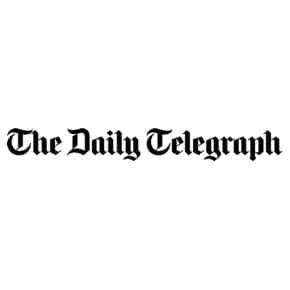 You can contact us for a quote at the bottom of the page using the ‘Get A Quote’ or ‘Contact Us’ form. A couple of examples of turned leg tables we have made in the past. If you would like drawers in the sides or ends they would be £50 each. They can be made to any size. Below is just a guide. Some examples of our refectory style tables. We can make these to any size, painted, waxed or left in the bare wood for you to finish yourselves. Obviously these tables can not have drawers. We made this refectory table for a customer a while ago. The base can easily be dismantled so delivery through difficult spaces is simple. The table in the image has an elaborate stretcher, but these can obviously be made to your requirements. This one was about 7 ft long and 3 ft wide, with a height of 30”. The prices below are a guide. If you’d like a quote then just let us have your required dimensions and a delivery post code (if delivery is required), and I’ll work out a price for you. We can make tables to the nearest inch. This particular table was made for a customer who had limited space but wanted the table to be functional. It was designed in mind to fit into a corner of their kitchen and used almost as a desk would. The customer asked for fairly chunky, straight legs and an overall solid appearance. It has been professionally wax polished to a very high standard. When deciding on your hand-made bespoke table, please discuss with us the type of finish you would like to achieve. Examples of some round tables we have made for past customers. These can be made with pedestal bases (if under 50" diameter) or on square 4 leg bases with either turned, tapered or square legs. Please ask for more details about prices etc. As with our other tables, the tops can be made from clean reclaimed pine or older more rustic old pine floorboards as required. Bases can be stained and waxed to match (as closely as possible) the tops, or painted in any colour. Pedestal bases are available with 3 or 4 legs, 3 usually on smaller tables. Tops are removable from bases for ease of transportation. We have made tables up to 14 feet long in the past, and as small as 2 feet, so what ever your requirement please feel free to ask for a quote. The legs of your table will usually be made in proportion to its size, but please ask if you would like anything specific in this regard. 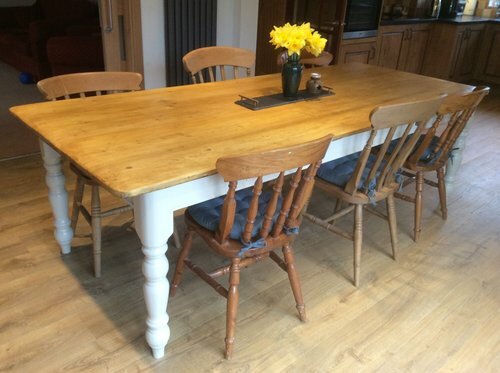 A 5' x 3' table with a painted turned leg base - painted in Farrow and Ball Pavillion Grey. The top made from old pine floorboards and sealed and waxed finished. 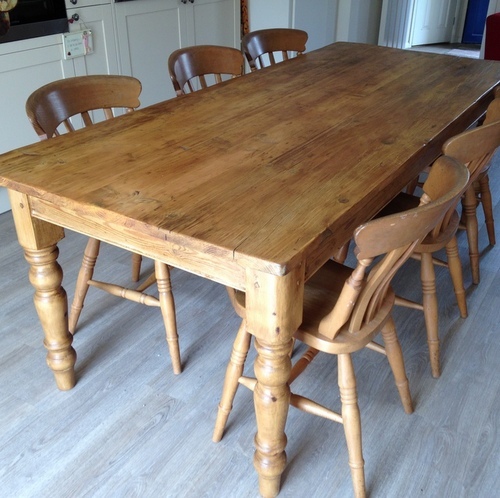 Tapered leg, turned leg, square leg, refectory style, trestle style, round and even oval top tables can all be made to order from old pine boards. Drawers can be made for tables other than trestle, refectory style and of course round and oval tables. Usually the price for each drawer is about £50, but please ask for more details. These coffee tables can be made to measure. Please ask for a quote..
Below we have some coffee tables we have made from new pine boards and with turned legs. These can be made to any size and can be bought waxed, in the bare wood or painted. Just let us know the dimensions you require and we will give you a quote. We can usually have them made within 2 weeks or so. You can see all of the pine coffee tables we currently have for sale here. Please let us have your post code (if you require delivery), and I will give you a delivery quote. Local deliveries are free and quick, other areas may take a little extra time. Again this will all be explained. We can usually have your table made within about 5 weeks, but this will obviously vary according to our current work schedule. If you have a deadline, feel free to ask if we can meet it. Please allow delivery time on top if required. See also all of the other pine furniture we can make to measure. Benches can be made to go with your table. Please enter post code if delivery is required. Normal, Trestle, Refectory, Round, or Coffee Table? Tapered, square or turned legs? Would you like the base painted? Will the table fit through doorways? Anything else?